Paying off your house is probably something that you’d love to do but like many of us you don’t have the funds to make it happen. Today we’ll look at some ways that you can make a dent in the amount you owe on your home loan and pay off your house early. For most homeowners your mortgage represents the largest outflow of cash from your budget every month. We like to think about all the things we could do in life if we didn’t have to pay to keep a roof over our head. Imagine how fast you could ramp up your retirement savings, build a college fund, or save up for a big vacation. In addition to the increased cash flow, having your house paid off also comes with a sense of security – that you own your home and not the bank. One tax note to be aware of on your quest to pay off your mortgage. For many of us homeowners the interest we pay on our mortgage is what enables us to itemize our deductions. If you pay off that loan you might have to start taking the standard deduction. Here are some ways you can pay off your mortgage early and reap financial benefits from not having that payment. The easiest way to pay off your mortgage faster than normal is to simply include additional money on every payment you send in. The additional money will go straight toward the principal of your loan rather than to paying the bank interest. Over time this will slowly pay down your mortgage faster than your original financing term. Check with your lender to see how they treat additional payments. Most banks automatically apply additional payments to any outstanding fees. How they handle extra payments after that can vary so be sure to note on your extra payment that it should be applied to your principal. 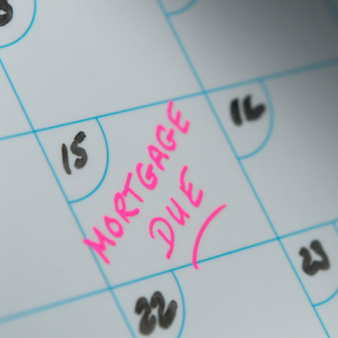 A second way to send in additional payments is to coincide your mortgage payment with your pay cycle. Since many people are paid bi-weekly you simply send in half of a mortgage payment on each pay day. This doesn’t seem like it would save you any money, but you’ll end up paying an extra month’s worth of payment every year. This is due to how the calendar year plays out. Most people know there are 4 weeks in a month, but over 12 months that is just 48 weeks. That means throughout the year there are a couple of times where you will get a 3rd check in that month even though you’re paid bi-weekly. If you send a half payment in on those pay days you’ll end up making two additional half payments (to bring us up to 52 weeks in a year). It’s an easy way to “trick” yourself into paying off your mortgage faster. Another way to pay your mortgage down faster is to refinance to a shorter mortgage term. If you’re three years into a 30-year mortgage and refinance to a 15-year mortgage you’ll save money over the life of the loan. Granted your payments will be higher every month, but the shorter term combined with the higher principal payments will save you a lot of money in comparison to your previous mortgage. Even if you don’t change the length of your mortgage in terms of the number of years you are still better off if you refinance to a significantly lower interest rate. The lower interest over the life of the loan will pay for any refinancing costs you have out of pocket and still save you thousands of dollars in interest. In contrast to paying a little extra each month, a mortgage recast is usually used to pay off a big chunk of your loan at once. When you recast your mortgage your bank actually reamortizes your loan based on the remaining term left on your loan and the new loan balance. Your interest rate remains the same but because you’re paying interest on a lower balance, the amount of overall interest you pay goes down. If you’ll remember from the amortization tables in the mortgage calculator post, since you’re paying less interest your monthly payment will drop. Ideally this will free up money each month you can use to make extra principal payments. Another benefit of a recast is that it can help you get rid of private mortgage insurance (PMI) if the lump sum you pay puts you over 20% down on the value of your property. There are some limitations on this strategy. Not all banks are willing to recast a mortgage so if yours doesn’t allow it then it won’t work for you. Most banks will have a minimum amount that you can recast and typically they’ll charge a several hundred-dollar recast fee. Some banks have limits on the number of times they’ll recast your mortgage. What are some additional ways you can pay off your mortgage early? Leave a comment! This article was originally published on May 4th, 2011. I chose the first option, making extra priciple payments, and I’m glad I did. It will cut about nine years off my 30 year mortgage and I will have my house paid off in 5-6 years. It is also very flexible, unlike refinancing to a 15 year term. When I was laid off for six months, I just paid the minimum payment. Then, I resumed my larger payments when I got a new job. The DIY bi-weekly is interesting. Many banks will not accept less than a full payment, so you may need to use the ‘envelope’ type method, putting aside the funds every check, but send in whole payments until you’re able to send the extra twice per year. A painless way to save some interest. With rates low as they are, I recommend being sure you have no other debt, and are max’ing out your retirement savings before prepaying the mortgage. Good tips. Or, just never pay it off b/c you know the government will for you if you live in one of the 7 non recourse states!